Everyone is talking about coupons. Extreme coupons. Printable coupons. Coupon techniques. Coupon lingo. It all gets a little overwhelming, honestly. Let Crystal & Co., be your go to site for coupon resources! Life is busy and in an economy like today’s we are all looking for ways to shave down our bottom line. With that said, I have pulled together a great list of places I go to when searching for coupons online. Personally, one way I cut back on my grocery bill is by doing weekly meal planning and always using real easy recipes. If you are overwhelmed starting out, Coupon Mom has a great book with all of the ins and outs of couponing and it is priced very affordable. She will help you cut your grocery bill in half. These are my personal favorite coupon resource sites. 3 Boys and a Dog has an easy to read chart which printable coupons from sites she recommends. She also has a great page that covers coupon lingo. The Greenbacks Gal is your go to site for Organic Coupons. Luv a Bargain walks us through how to start using coupons and she also shares resources for printable coupons. Crystal & Co shares printable coupons and great deals through out the week. 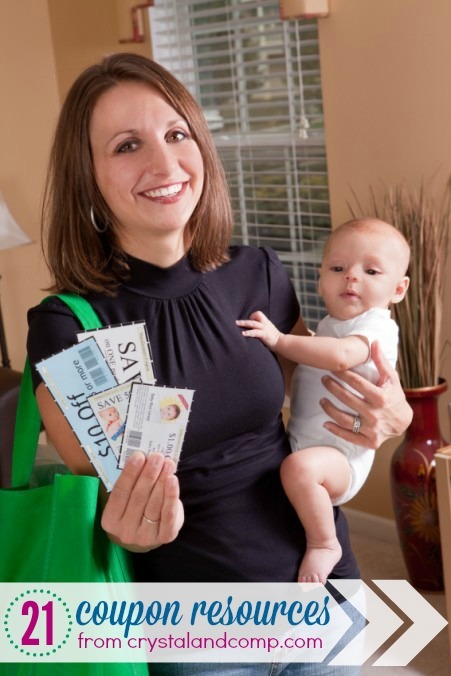 Money Saving Mom– great site for coupons and ways to save money period. Surviving the Stores shares printable coupons and great information on where to begin. Grocery Shop for Free has a great coupon database. Since this page went viral over a year ago (thanks to Pinterest) there have been tons of views and lots of readers leaving their input. I wanted to highlight some of the favorites left in the comments by my readers. Also recommended by a reader is a book called Couponing Made Simple. I am told the book teaches you an overall plan for saving big at the grocery store and you’ll see immediate results on your grocery bill. I also look forward to connecting with you over on Facebook and Twitter!